I recently read a book called The Replicator Moment, and while it was a really terrible book I really loved the phrase so I’ll keep them in mind for that. Our Replicator Moment is most certainly here. We’re in it, living through it, watching it unfold. If you don’t know what 3D printing is up to – you really need to get caught up fast. You don’t want to miss being a part of this. 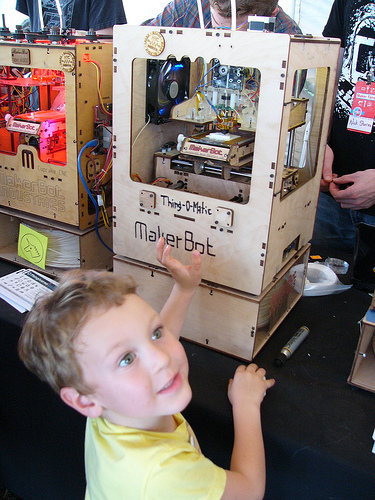 Overall, there’s an awful lot going on in 3D printing. We’re really at the point at which these machines are going to keep getting better, cheaper, then start combining multiple types of printing into one machine. Once we are solid on making the organic printers, there is no reason we can’t start with a basic organic molecule binding process (like the machine which creates tissue) and use that as a sub-routine to make the materials needed to run various types of print jobs. Meaning that you have one low-level printing process which creates the plastic, wood, metal, tissue, etc… on demand depending on the types of ingredients needed. In reality, there are only a few base elements which make up everything and the rest… well that’s just bonds between atoms – and we’ve had the schematics for those for ages. I definitely picture the food replicator taking place in my lifetime. Is that genetically modified if it is an exact genetic clone and not modified at all? Is there much discussion to have on the ethics of it all? Very likely. But it’s a fascinating time to live in.